NOTE: all email addresses below have a built in spam filter and you must remove the SPAMCHECK portion before sending. I have a press request. 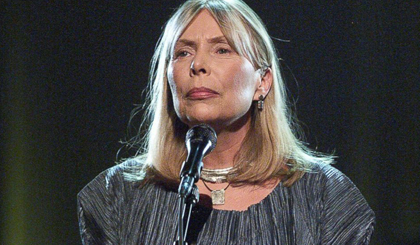 I'd like to record or arrange one of Joni's songs, or use her lyrics in a publication. Contact Alfred Music to obtain licenses. There will be no gratis or reduced rates, therefore publisher permission is not needed, just the license so that payments can be directed to Alfred Music. -Creation of a new version of an existing composition. -Selling your original arrangement of an existing composition. -Use of lyrics in a publication (eg. books, periodicals, and other printed media). -An audio recording of a composition on a tape, CD, or Digital Download format. -A video recording of a composition on a video tape, DVD, or Digital Download format. -A broadcast of a recorded performance for television, film and radio. -Public performance of copyrighted material. -Requests to make photocopies of compositions that are no longer in print. -Posting of copyrighted material on the Internet. I'd like to use one of Joni's songs (her recording, her voice) in a film, on TV, in a live stage production, or some other form of media. And, you may also need permission from Warner Music Group if they control the masters. I'd like to print/project/display photos of Joni at a public event. Photo permissions need to be obtained through each individual photographer or copyright owner. Occasionally, but certainly not always, we can help you identify the photographer. Send us the photo(s) in question.